Devi (Chennai, India) on 25 September 2014 in Animal & Insect and Portfolio. 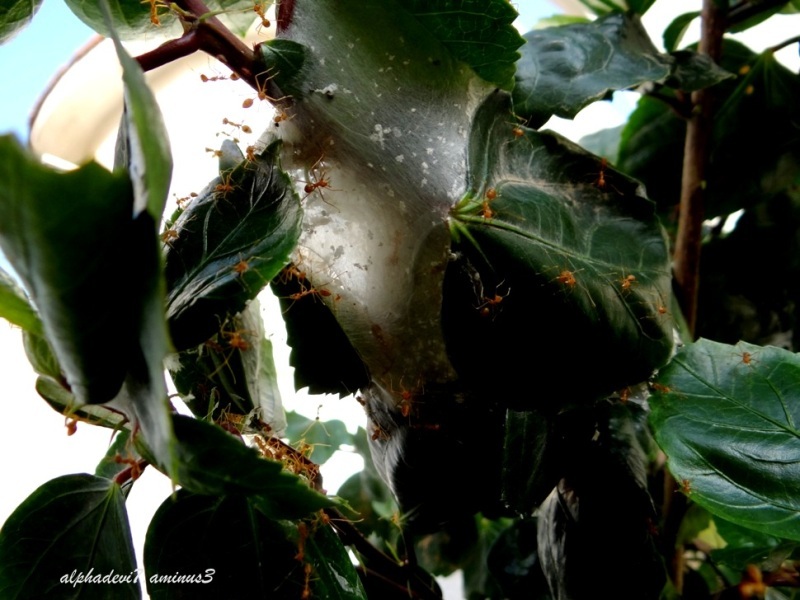 Another view of their nest..wonder how they build this transparent wall between leaves. May be they secrete some fluid!! And wonder how many of them live in there !! Hrrrr .... and more of those horrid ants. A nasty-looking, they are eating the plant so badly that it will die? I do not like of these animals!:-)))))))))))))Haleja. Good Thursday, my good friend! with beautifu composition, focus, details, colors & lighting! Great shot, Devi --- I like this series ...... amazing how little subjects can give such interesting and great pictures. @Shiva: Thank you Monika...it is said that ants are very important in the eco chain!! @Patrick M.: Yes ..... army...God save the small bees or other insects which may get trapped here !! It is fascinating to see how elaborate they built this seemingly impossible structure. A fine shot. @Don: That was what amazed me too !!!! Overnight, this transparent wall between the leaves....amazing tailors too here ! Another great shot in this interesting series, Devi. @Sam: Thank you Sam :)) I am amazed too..seeing them getting this translucent wall overnight ...how they brought the leaves together....is a mystery..and how many of them working together here !!! It almost looks like a web. An interesting series. @Adela Fonts: Ha !! Ants are fine with me...But I just get horrified about spiders..I don't even look at their pictures!!! Stunning capture. Thanks for sharing this. Hope their bites are not like our fire ants. They hurt and make little blisters. Fire ants are named that because that's how the bites feel. @B. Thomas: Their bites are poisonous. It is difficult to pull them off the skin in the first place!!! Fantastique vue et compo quel rendu sur ces feuilles.